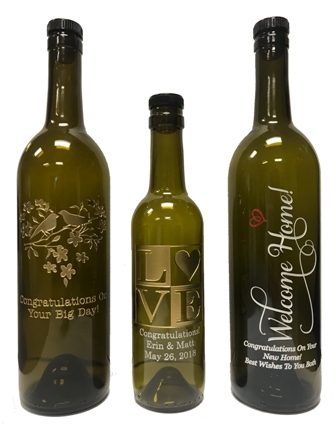 Say I Love You with this personalized bottle! Each bottle is etched and hand-painted by skilled artisans. This commemorative bottle can be enjoyed for many years to come. Choose your favorite olive oil or vinegar. The bottle can be refilled in any of our We Olive locations (price per ounce may vary per location). Be sure to bring your bottle back clean and dry. Hand-wash only. You can add up to three lines of personalized text. Maximum 25 characters per line. Spaces and punctuation are considered a character. Personalized text is optional. One or all lines may be left blank if you choose. CRITICAL REMINDER - PLEASE PROOF-READ your text carefully. We etch the text exactly the way it is typed. Unfortunately, we cannot be held responsible for misspellings, incorrect dates, or missing punctuation. Please allow 7-10 days for processing, plus 2-7 days for shipping from California. Other items in your cart may ship separately.